A fantastic week, my best of the season so far mainly thanks to a last minute gamble that paid off big time. I ummed and erred all Friday night and Saturday morning on my Triple Captain chip before finally settling on the decision to go for it at around an hour before the deadline. It was then a case of Aguero versus Sane, a decision that I thankfully also got correct. 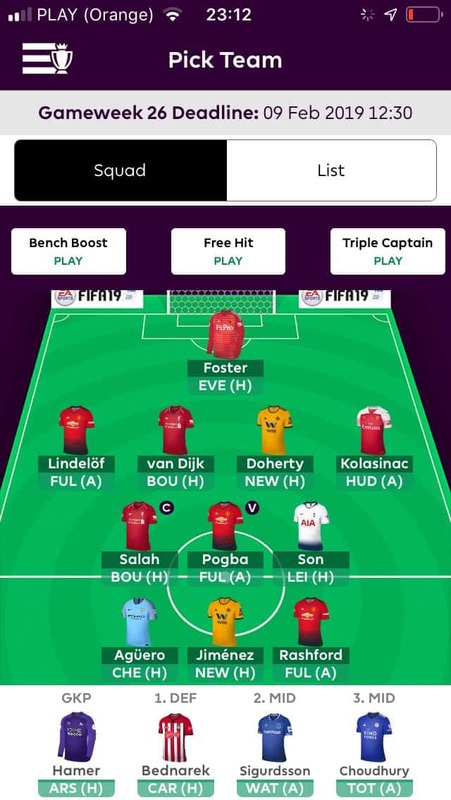 The result was 57 points that made my gameweek and has given my team a huge boost up the rankings. It’s the most success I’ve had with a Chip that has always usually a bit of an albatross around my neck with my previous best being a 36 pointer from Dimitri Payet a few seasons back. Definitely more Silver Bullet than albatross this season! The rest of the good stuff mostly came on Sunday with Rashford and Pogba both returning to add to Jimenez and AWBs returns on Saturday. The negatives were getting my defensive call wrong by leaving Shaw and Bednarak on the bench, blanks for Richarlison and Sane and blanks for my 3 Liverpool players. I’m in decent shape though, I’ve got 2 transfers in the bank with no significant injuries. Hopefully I can ride this high into GW26! It’s all about working towards GW32 for me now. I’ll be finalising my double gameweek strategy after the next set of FA Cup matches once I know who will be blanking in GW31. 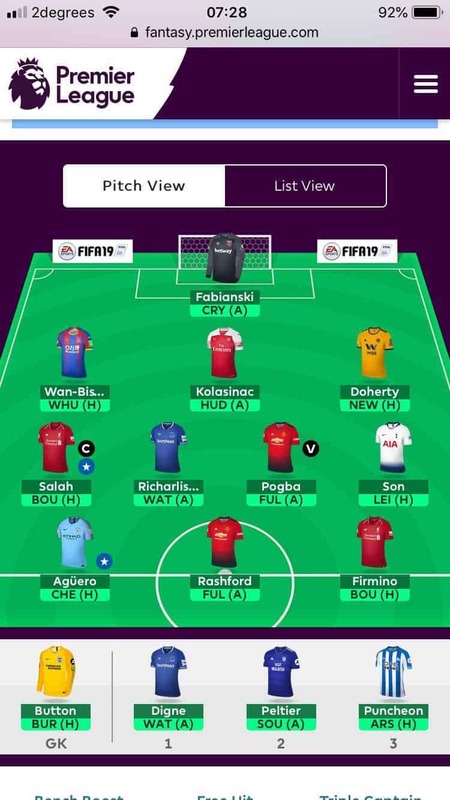 So for now, I want to try and conserve transfers where possible and bring in players who I think will be either be in my GW32 DGW team or in my blank GW33 team, with me intending to use my Free Hit in GW31. My original plan had been to bring in Aubameyang for Aguero this week. This would be a safe transfer for a couple of reasons. First up, Arsenal have a GW33 fixture which works for either strategy I’m considering. Secondly, it would mean I’d be selling a player who blanks in GW27. Not to mention the fact he has a great fixture this week! This plan however has hit a snag in that he’s a major doubt for the Huddersfield game with illness. I’m also reluctant to sell an in-form Aguero after his hat-trick last week. I’ve therefore put this one on the back burner and might do it next week. Instead, I’m going to shift another player who blanks next week so it’s either Sane or Richarlison on the chopping block. Gametime is the concern for Sane, for Richarlison it’s poor form. In the end the decision of who to sell really relates to the price of the player coming in with Son the obvious transfer in for me. He’s not an ideal GW32 option as there’s uncertainty as to whether Spurs will have a fixture in GW31 or 33, but he’d be an easy player to hold or move if necessary. Plus he’s in great form; so he comes in with Sane departing. Now onto team selection and I’ve some nice dilemmas, especially in defence. I’ll be starting VVD as usual and Jonny versus Newcastle looks a good chance of a clean sheet. 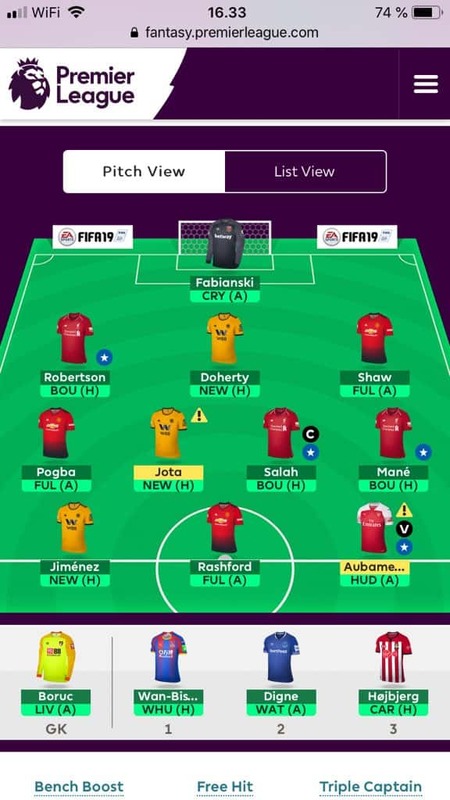 I’ve then got AWB at home to West Ham, Shaw away to Fulham and Bednarek at home to Cardiff – all good chances of returns. Plus I’ve also got an out of form Richarlison in midfield away to previous club Watford – that could go either way! In the end, I’ve decided to bench Richarlison and Bednarek, possibly a risk with the former but I worry that he’ll be benched again this week. Salah looks a popular choice for captain so I’ll be putting the armband on him. All the best for GW26 folks – may your arrows be green! 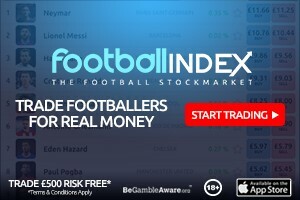 Sterling and Aguero out for Son and Aubameyang – 4. Good luck everyone! At last a reasonable score. Green arrow up to 394k. Still a long way to go to get to my idea of a respectable score but a step in the right direction. Triple captain on Kun was the difference. Selling Hazard to fund it looked a terrible move on Saturday after Hazards brace but thankfully came good. Transfer of San? to Son (I was going to do Kun to Aubameyang but the illness rumours have put me off). Still not happy with my team. Wolves attack looks excellent and I?d like to get in on the Pool defence as well. Transfer summary. Sane to Son HM. I thought Kun to Auba was the move I’d make for #GW26 but the uncertainty over Auba’s start led me to hold fire. So it’s just Sane to Son this week. Rob, my friend is in the same shoes as you having no WC. I discussed this exact same strategy with him earlier today (have to focus on dbl 32 that ALSO play in 33). Your article has confirmed that is the best move. My question to you: the three teams that currently fit that mold are Ars, Sou and Eve. So why the heck would you even think about moving Richarlidson, poor form or not? He is one of your only dbl 32 and plays 33 teams as it stands.